Kick it out with this sharp kit, ideal for the aspiring drummer. Durable and easy to assemble, the Ion drum kit is expertly designed to give you a full, resonant sound. This starter kit includes a bass drum with a stand, floor tom with adjustable legs, hi-hat with foot pedal, 16 in. cymbal, tom toms and more. Plus, you also get an adjustable seat and sticks... everything you need to begin your drumming journey! "Most Attractive Starter Drum Set Ever, And Plays Wonderful." Sound: The sound is very professional, even for just a starter kit. Feature: It includes everything you need to get started. Quality: It does seems like it will last, no parts are loose or anything, there's no bad aspects about it, and I can depend on it. Value: This product is definitely worth it's selling price. Manufacturer Support: Never had any problems where I had to contact the company who made this product. 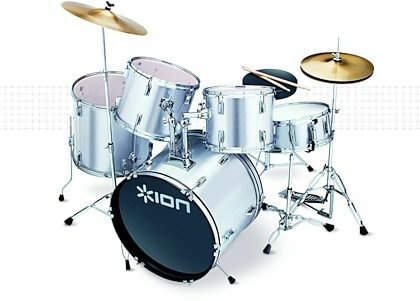 The Wow Factor: This is the BEST looking starter drum set I have EVER seen, no lie. The color, and the way it's made is perfect. Overall: I think this product will last unless somebody does something to it that tears it up. Whoever buys it will be VERY satisfied.